A super stunning tropical home that everyone dreams of. Would you love to live near the water edges of Miami, Florida? Of course you would say yes! What you would get once there is not just an island paradise experience, but, an island luxury living in a high-end tropical environment in a secluded, exclusive and a gated community in Hibiscus Island, Miami Beach, Florida. A waterfront house with a great indoor and outdoor living so suited for Miami’s year round tropical climate, from a long summer, abundant rainfall, and a mild, dry winter. Surely, this island property that we will feature today is a masterpiece to the designer and a priced-possession to the homeowner. This modern house design was made possible by Architect Ralph Choeff of the Choeff Levy Fischman Architecture + Design, built by Bosch Construction. A house with a modern architectural design and a high-end tropical environment. 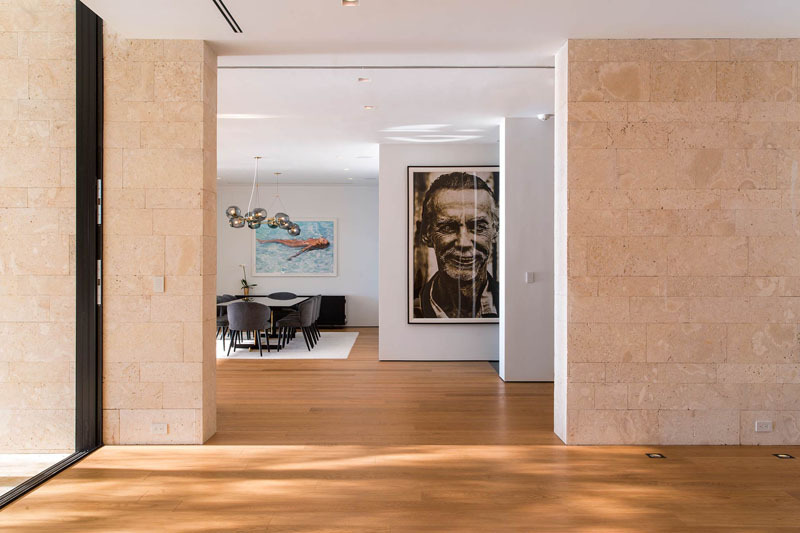 Considering that this house is nested in a private island community in Miami Beach, Florida, the quality of living here is of great pride and price. Let us know more of this luxury island paradise living through this Hibiscus modern waterfront residence. Unique feature: A waterfront residence with a tropical architectural design and great massive indoor and outdoor living. 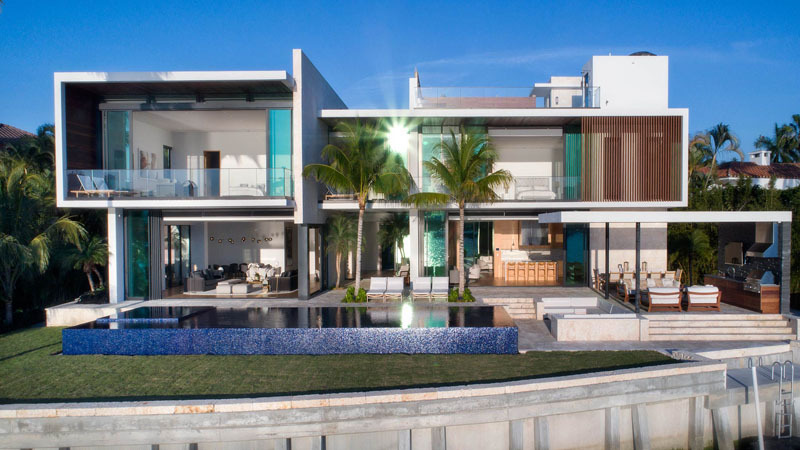 This is an astounding front view of this Hibiscus Residence. 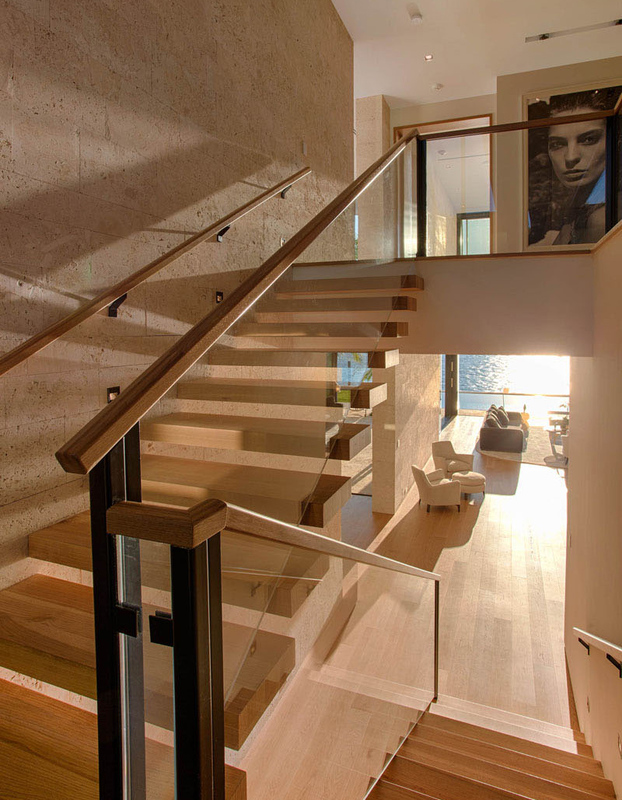 A two-level water-front house located in the water edges of Miami Beach, Florida. 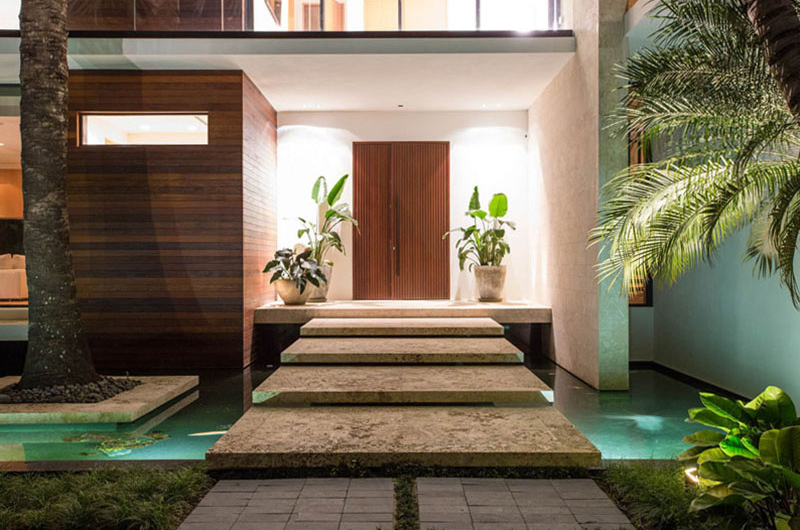 Ipe wood, natural stones and water features are the tropical elements commonly used in this house. To the right of the house is the garage guarded in steel railings. Palm trees were placed to achieve a tropical tone in this modern architecture. A simple wooden door opens the house to its indoor spaces and a lit up entryway warmly welcomes guests to the house. Also, stone steps leading towards the door travel over a Koi pond, one of the house’s tropical touch. Ornamental plants and palm trees surround the area. This rectangular swimming pool is one of the great outdoor space in this house. Its underwater light effect reflects the water element of the pool. Lounging seats were in place to give comfier and a relaxing pool experience. Surely, your swimming pool experience here will be different from a sandy beaches bath along Miami Beach. Towards the end of the swimming pool is a covered entertaining area with a sunken lounge and an outdoor kitchen. 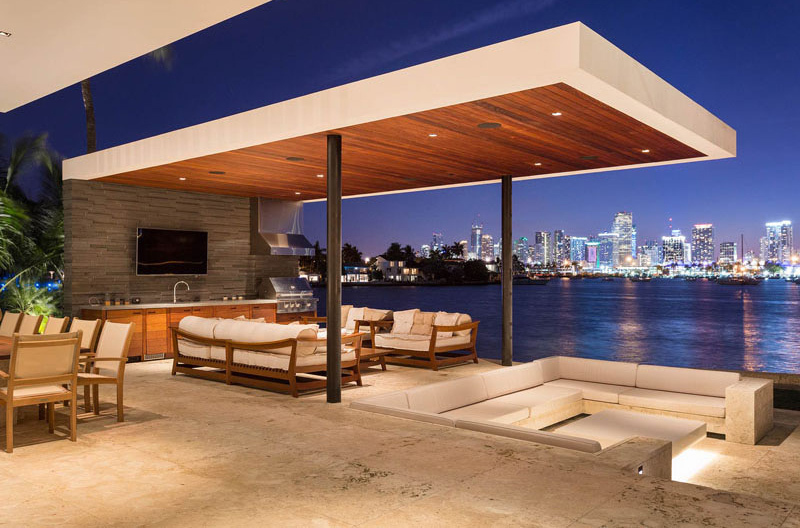 During night time, it’s best to enjoy the view of the city light while lounging with family and friends in this classy and modern outdoor space. From this photo, the glass panel set as the boundary from the outdoor space to the indoor space of the house. Its interior is a combination of wood and glass accent. Plants placed inside the house add a tropical aura to the space. In the living room, continuity of accent and design is achieved. Light brown wall and floor tiling compliment the white ceiling of the space. The modern kitchen design was achieved through a light wood cabinetry and white top design. An island is placed to accommodate five setters. 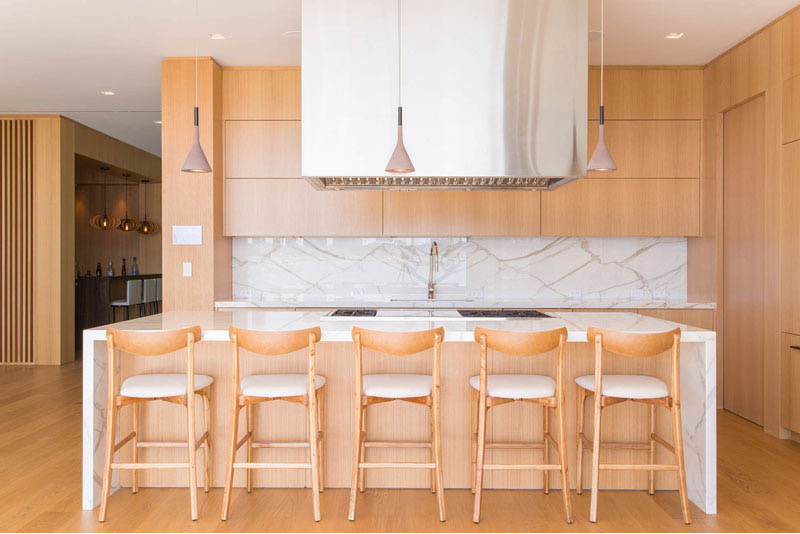 Above the island are three pendant lights that give off simplicity and beauty to the kitchen. One of the house great indoor space is this media room with a bar beside it. This space is best for a lazy afternoon. Large white couch, pillows, and chairs were added to accentuate the room. The bar on its side will surely add flavor to your high-end experience. Contrasting colors of black and white made the living room more classy. 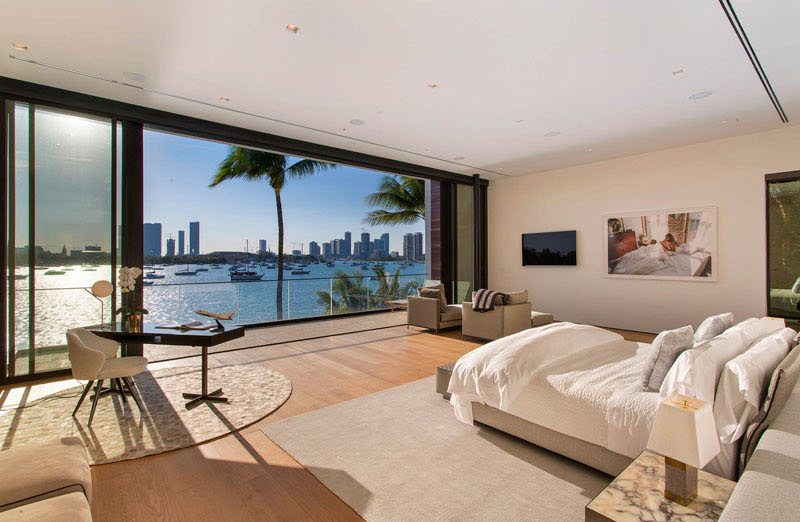 Glass sliding doors can be opened completely for an uninterrupted view of downtown Miami. Below it is the rectangular type swimming pool. Safety in style. Light wood stairs with glass railings lead to the upper floor of the house. The materials used for the stairs look great together. One will not question the strength of the glass material and the wood reflects its tropical touch. 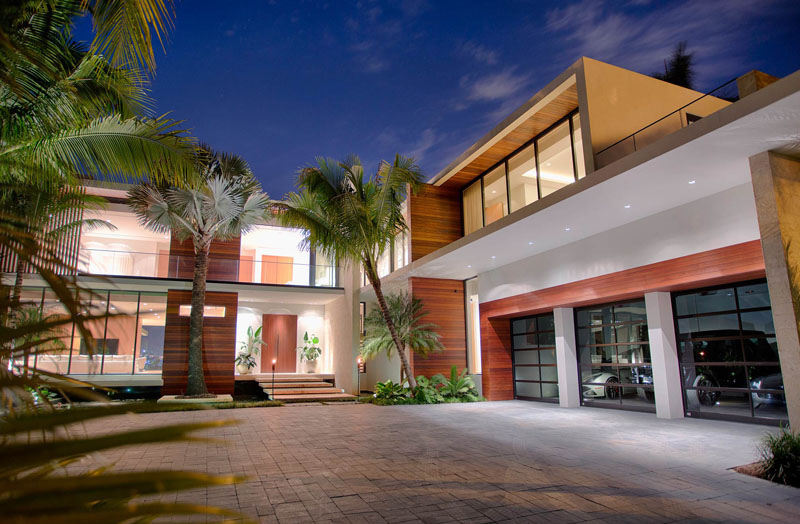 Modern and tropical. Another great indoor space in this house is this chic and luxurious master bedroom. A small sitting area and working area had been incorporated into this room so that one can lounge and work at the same time. A glass surround wall is placed for an interrupted view of the downtown Miami. Onward is a balcony which is great for some open yet private moments. And, the space is in great combination with its white ceiling with hidden lights, white wall, and light brown floor tiling. This is one of the many bedrooms available in the upper space of the house. A wall of cabinetry surrounds the room good for plenty of storage. The bed, its linens, the lampshade, tables and the floor carpet is in consonance with the theme of the whole space. The master bathroom is placed next to the master bedroom. The space looks great and perfect for its dual sink vanity, a shower with a floor-to-ceiling glass surround, white freestanding bathtub, with views on the palm trees through the large glass windows. Its white ceiling provides a wider space, while the hidden lighting from it emit warm glow on the wood wall and the floor. Truly, this house is a masterpiece project of the architect and at the same time a prized possession to the house owners. This may be of a very great market value, yet, undoubtedly, the island paradise living it may offer is priceless. This is just another achievement to the Choeff Levy Fischman Architecture + Design for this Hibiscus Island Residence. It is a fact that Miami’s cost of living is really priced high, thus, a home owner resident of Miami will be very much willing to sacrifice cost for luxury, comfort, modern, and tropical island living experience this Hibiscus Island residence can offer. Stunning island, stunning house. Amazing pictures. Just love to read. A wonderful place to live! Amazing architecture!